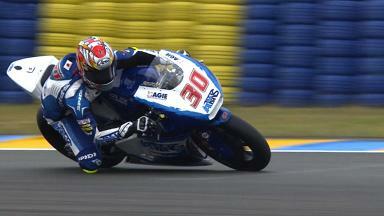 Japan’s Takaaki Nakagami has achieved a career-first pole position for the Moto2™ Monster Energy Grand Prix de France. The Italtrans Racing Team rider will share the front row of the grid with Marc VDS Racing Team’s Scott Redding and Came Iodaracing Project’s Johann Zarco, who is the leading French rider. Nakagami, who starred at the start of the 2013 season by leading and finishing on the podium in Qatar, saw pole position confirmed as rain finally fell at Le Mans in the second half of Saturday afternoon’s 45-minute qualifying session. With a lap time of 1'38.508, he had already seen off Redding and Zarco by the comfortable margin of three tenths of a second. Tuenti HP 40’s Esteve Rabat heads into the fourth round as championship leader. He will line up fourth on the grid from Desguaces La Torre Maptaq’s Xavier Simeon and Mapfre Aspar Team Moto2’s Nico Terol, with Tuenti’s Pol Espargaro – who sits third in the riders’ standings behind Rabat and Redding – coming from seventh at the start. The top ten of the 34-rider grid will be brought up Interwetten Paddock Moto2 Racing’s Tom Luthi, NGM Mobile Racing’s Mattia Pasini and Marc VDS’ Mika Kallio. Britain’s Gino Rea will start 31st on his return to the series with the independently-entered Gino Rea Race Team squad, whereas Federal Oil Gresini Moto2’s Doni Tata Pradita was the only faller in qualifying. Sunday’s 26-lap Moto2™ Monster Energy Grand Prix de France will start at 12:20pm local time (GMT +2) and there is a strong chance of steady rainfall.